Home > Lifestyles, Nature, Seascapes	> By the light of the moon. When other photographers have packed up their gear, I remain on scene. Some of the best images can be caught not only after the sun sets, but once the moon rises. 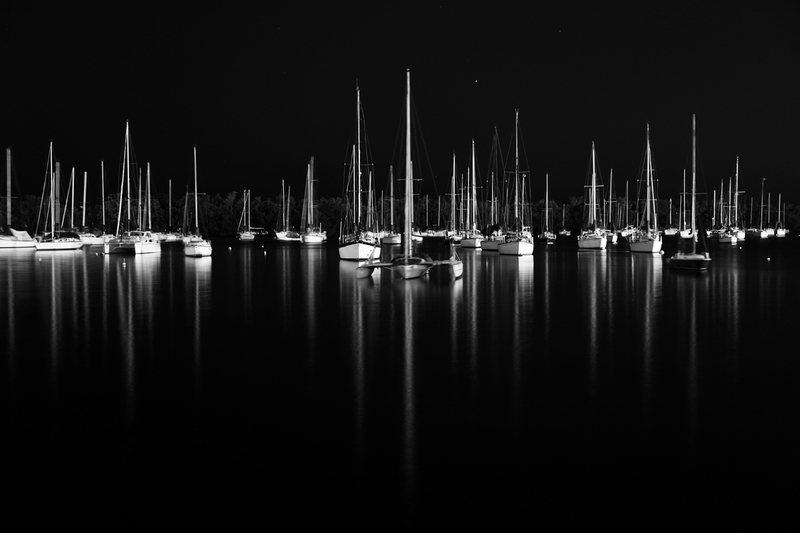 In this case, after shooting the sailboats as the sun set, the rising moon lit the line of boats moored in Sailboat Bay. The trick here was capturing one image while the water was perfectly still, showing no motion except for the Catamaran positioned in the front, center. Again, thank you. It was the magical moment when the wind disappeared and the water and sailboats became eerily still. Wow! It never crossed my mind to use the moon as a light source. Great stuff and what an amazing photo! It often makes for a beautiful light source, but a tripod is a must. Thanks. Looking up. Getting the shot… at all costs.